Until 1751, the Regiment had eight different Colonels, and therefore eight different names. In 1751 regiments were given numbers, and the Regiment was numbered 29. The Worcestershire Regimental Archives hold extensive records and other material which could help anyone researching their ancestors who served with the regiment. They also provide advise. Since the Worcestershire Regiment was raised in 1694 there has been many fine commanding officer. In an effort to preserve the history of these officer, this website is now building up a record of all the Battalion Commanders. The barracks date back to 1874 when building started. Three years later it was completed and handed over to the Regiment. This section gives details the history of the barracks from 1874 to 1990. New Book which tells the story of Norton Barracks from 1874 to 1982 and of the soldiers who served there. Published in 1891 this book provides a full history of the 29th Regiment of Foot (later designated the Worcestershire Regiment) from 1694 to 1891. Throughout the book reference is made to the Regimental dress and uniform with details of badges and insignia. This unique book tells the first hand stories of men who served with the Worcestershire Regiment in WW2. The veterans relive their experiences and lucky escapes as they recall the years they fought across Europe. Highly recommended read. Monday 4th August 2014 marks 100 years since the start of the World War One. The Worcestershire Regiment lost some 10,000 men during the conflict. As a war unmatched to any seen before or after, World War One, also known as "The Great War", marks one of the most defining moments in modern history. Sunday, 31st October 1914 was a fine sunny day. The 2nd Battalion scouts were sent on ahead to reconnoitre and cut wire, led by Lieut. Haskett-Smith and Sergt. Poole. Objective was achieved but Lieut. Haskett-Smith severely wounded and Sergt. Poole, with many others were killed. Private Herbert Thomas Beard served with the 1st Battalion Worcestershire Regtiment in the Boer War in South Africa in 1900. He wrote a short diary of his time in South Africa which gives details of where he went and what the Battalion was involved in during 1900. On the 10th July 1944 the attack on Hill 112 started and went on for nearly two weeks. Finally the 1st Battalion Worcestershire Regiment carried out a night attack (22nd/23rd July 1944) in which they suffered many casualties, including Major Peter Weston who was killed by machine gun fire at the top of Hill 112. The morning of 18th November 1944 saw the 1st Battalion Worcestershire Regiment move across the Dutch/German boarder and commenced their attack on German soil to take the village of Tripsrath. As part of 214 Brigade they were the first British troops to fight on German soil. Their job was to take the north-west side of Geilenkirchen to cover the left flank and support the Americans. The Long Service & Good Conduct (LSGC) medal was instituted in 1830 during the reign of King William IV. The medal was originally awarded to infantry NCOs and men who had completed 21 years' good conduct. In 1870, this qualifying period was reduced to 18 years. Many soldiers of the Worcestershire Regiment have been awarded this medal since its introduction. Extracts from the notebook of Lieutenant William Tunstall who served with the 36th Regtiment during the Peninsular War. Appointed to the 36th Regt. from the Militia on 11th May 1809, and joined at Battle, Sussex, where it was busy re-organizing, and replacing losses sustained during the Retreat to Corunna. During 1944-45 the 1st Battalion Worcestershire Regiment were awarded 35 medals for bravery and distinguished service in the field of battle. Five officers serving with the Battalion were awarded the Distinguished Service Order and a further seven awarded the Military Cross. Some 20 Military Medals were awarded to the rank and file. During the 7th Battalion Worcestershire Regiment withdrawal to Dunkirk in May 1940, Lieut. Ron Goodwin lost his diary during the haevy fighting near the La Bassée Canal. A German soldier, Horst Kallmeyer, found the diary and started to use it himself. Some 65 years later the diary was found by the grandson of Horst Kallmeyer whilst clearing out his grandparents apartment. At the beginning of the First World War in August 1914 the Royal Flying Corps (RFC) only had 166 aircraft. By July 1916 this had reached 421. Due to the heavy losses more pilots were required and officers from the Army where seconded to train as pilots. During this period many Worcestershire Regiment officers and men where transferred to the RFC, which later became the RAF. Fred "Joe" Lynch was conscripted into the army in 1945 as a private soldier. He reached the rank of Sergeant in just 2 years and was made Regimental Sergeant Major in 1959. By 1966 he was granted a commission as Lieutenant (Quartermaster). He rose through the ranks and became Lieut.-Col. in 1979. He was a regular member of the Regiment Shooting team. Veterans and guests of the 1st Battalion, N. W. Europe(1944-45) met for their last annual reunion dinner on Sat. 14th May 2011 at Kidderminster. This website contains a large collection of photos which have been submitted by members of the public. 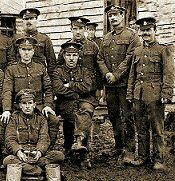 If you have an interesting photo relating to the Worcestershire Regiment and would like to submit a copy to this website then simply CLICK HERE FOR DETAILS.